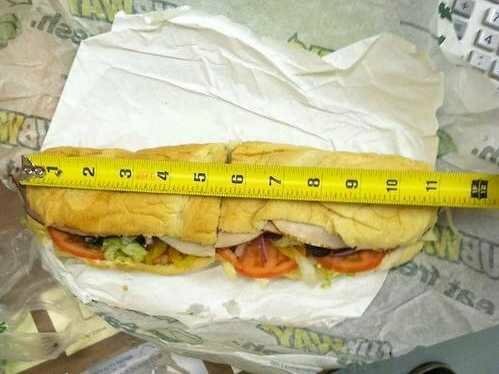 In actuality, the fact the sub may be 11, 12 or 13 inches long isn't really worth discussing expect for social media trolls with way too much time on their hands. That said, social media has a way of bringing minor issues to mainstream conversation. The New York Post did some digging and found four out of the seven footlongs they purchased were shorter than 12 inches. Of the tempest in a teacup, Landor Associates Managing Director Allen Adamson told the Huffington Post, "People look for the gap between what companies say and what they give, and when they find the gap - be it a mile or an inch - they can now raise a flag and say, `Hey look at this,' I caught you,"
"As you know, all of our sandwiches are made to order, and our bread is baked daily in every one of our more than 38,000 restaurants in 100 countries worldwide. We have policies and procedures in place to ensure that our products are consistent and have the same great taste no matter which Subway restaurant you visit. We have seen the photo you referenced of a Subway sandwich that looks like it doesn't meet our standards. We always strive for our customers to have the most positive experience possible, and we believe this was an isolated case in which the bread preparation procedures were unfortunately not followed." Minor as an inch may be, the power of social media has the ability to magnify things in a way never before possible. And minor as an inch may be, a brand has to deal with the backlash. Had we been manning the brand, our suggestion would have been for Subway to create, bake, and personally deliver a one inch sub to Matt Corby - and every other person experiencing the deficiency in length - along with several months worth of free coupons to make up for its mistake. It would have been a simple and hilarious solution. And, it would have been chatted up on social media just as much as the debacle that started it all.